La Bavière, a menuet and forlane, choreography by Guillaume-Louis Pecour. La Fanatique, a sort of rigaudon to a ‘marche des Fanatiques’ by Lully, choreography by Feuillet. Le Cotillon, a branle (in fact a gavotte) by an unknown choreographer. He reminded his readers that he would continue to publish his collections of ball dances each November for the forthcoming year. He also announced the publication of his Recueil de contredances at the beginning of 1706 – ‘les Contredanses d’Angleterre … aussi fort à la mode’. Le Cotillon is an earlier form of the contredanses françaises – cotillons – that would become a dance craze in the 1760s in both France and England. The musical structure for the dance is AABABA x 6 (A = B = 4). There are a series of Changes, to each AA, between which the same Figure is danced, to the BABA music. The terminology ‘Change’ and ‘Figure’ is that used when the cotillon, a dance for four couples facing inwards around a square, reached London in the mid-1760s. These are recognisably related to English country dance conventions. The 16-bar figure is much simpler than those to be found in the later cotillons. One man and his opposite lady perform a sequence of steps taking right hands and then their partners do the same. Feuillet notates all the steps in Le Cotillon. These, too, anticipate the vocabulary of the later cotillons. Dancers use pas de gavotte (contretemps to first position, jump and step) when moving forwards and backwards and demi-contretemps when moving in a circle. Sequences usually end with an assemblé. 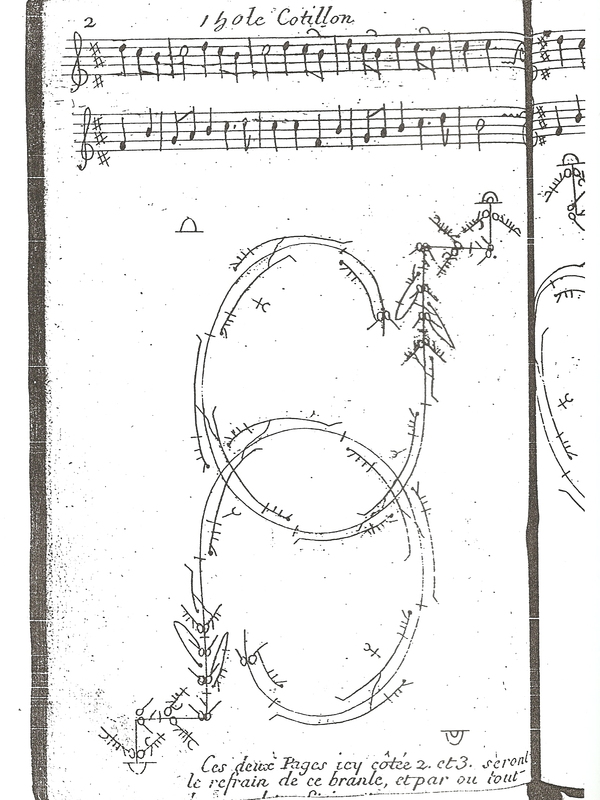 The figure uses a sequence beginning with a jump on two feet with a quarter-turn and then back, pas de rigaudon and a jump on two feet, a step and then a series of demi-contretemps ending with an assemblé. The steps are easy and the sequences are straightforward and predictable. 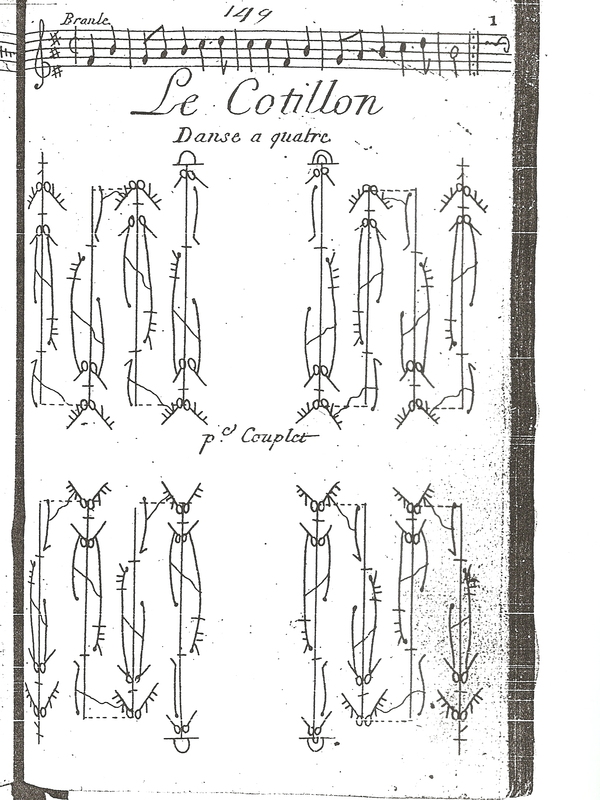 As Feuillet promised, dancers could perform Le Cotillon with no prior practice. Le Cotillon (1705). First plate. Opening Change. Le Cotillon (1705). Second plate. First half of Figure. This entry was posted in Ballroom Dancing, Country Dancing, Steps & Figures, The Cotillon and tagged Baroque Dance, Cotillion on February 9, 2015 by moiragoff.